During November, I found myself the proud owner of a brand new job - in the publishing industry, no less! Which is exciting, but also scary, and landed me in marketing assistant boot camp just days after I crawled over that 50,000 word finish line. I’m also still in the throes of law school prep, which is now back in full swing as I’ve doubled down on my LSAT preparation and picked up my program research. Also, the holidays are a think. There are cards to be sent and gifts to be bought and dishes to bake for the parties that need attending (and sometimes planning, too, if you decide to offer up your house for ugly sweater festivities - guilty!). So. There’s all of that. I’ll spare you my anxious, frenzied thoughts about all that. 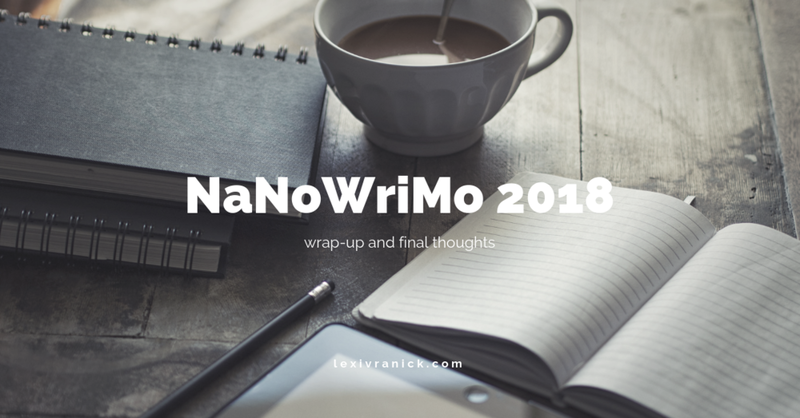 Instead, let’s talk about NaNoWriMo, as long as you’re not too bored with that topic by now. And she’s right, as mothers often are. This November I traveled, I went on interviews, I got a new job; I went to weddings, I babysat some dogs, I reconnected with old friends. I studied for the LSAT, and I stressed about studying for the LSAT, and I got so stressed that I had to put the LSAT books away and deal with the anxiety they caused. I set up the foundations for Little Lion Literary, the literary & arts journal of my dreams. So, yeah, NaNoWriMo was not the only thing on my plate. And with all that considered, I’m damn proud of myself for crossing the finish line. I began the month with four potential story ideas to entertain. I wound up working on two of those: a superhero epic, and a slasher story that was a little bit Halloween and a little bit Dexter. A few years ago, I worked on multiple stories for the first time, and I’ve found that this kind of split attention actually helps me keep my focus. One thing that plagues me around week two or three of every National Novel Writing Month is the inevitable burn-out - that tired, beaten down feeling that makes you look at your work with a hyper-critical eye and makes you feel trapped in quicksand, sinking deeper with every word you struggle to write. By giving myself multiple options, I’m able to bounce back and forth depending on which story speaks to me that day, and this year I’ve come away with workable drafts for both projects. Another thing I’m proud of is my dedication to writing every single day of the month. Sure, I didn’t always cross that 1,667 threshold. Some days I managed to spit about hundred words onto the page before throwing in the towel, but each of those hundred words got me closer and closer to my goal. Over the past year, I’ve drifted in and out of depressive episodes. This isn’t exactly uncommon. I’ve spoken about my mental health issues before, and these diagnoses are an every day kind of thing. They don’t go away; I’ve just learned to manage them. However, quite a few times this year I’ve found that managing them took time away from my work, which only deepened the depressive feelings I was battling. Therefore, I was determined to use NaNoWriMo to break the on again/off again writing cycle I’ve developed and begin writing every day again. It worked. I wrote every day, even if it was just a little bit, and I came away with two pieces that I’m proud of and excited to work into something publishable. And on top of all of that, I’m glad for the new friends I’ve made. In hosting #NaNoWineO chats on Twitter this year, I’ve found a small circle of incredibly encouraging, kind, and compassionate fellow writers who I am glad to now consider friends. We may only meet once a week over social media, but those connections are invaluable as an artist. They kept me motivated and confident, even when I wasn’t sure I would make it to the finish line, and reporting word counts to them each week kept me accountable for my work. I can’t thank them enough. So, to wrap things up, this National Novel Writing Month, with all its ups and downs, was one of my favorites. It was certainly one for the books, full of new friendships and lessons that needed learning, and I believe its helped me create some books that I hope to one day share with you. And isn’t that what NaNoWriMo is all about?